Making your CV is hard... Making your CV in SchoolPoint is really really easy! SchoolPoint takes your information we already know, and information you enter through other areas in SchoolPoint and makes a click through CV Builder. Update your Personal Statement, Skills and Interests and your Work Experience then link in with your LinkedIn Profile to then generate a great CV in Microsoft Word and PDF formats. You can use your Student Photo from KAMAR or upload your own to really personalise your CV. 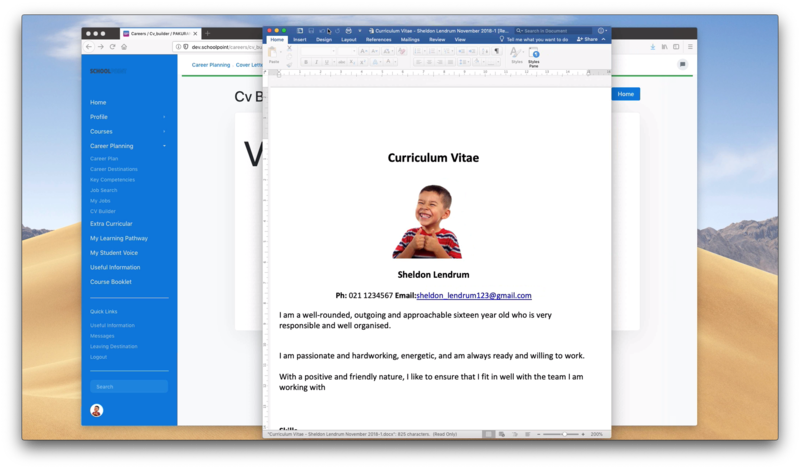 For every CV you give out, we make it simple to create a personlaise Cover Letter, and as part of the CV Builder, enter some basic job details and generate a Cover Letter to accompany your application!